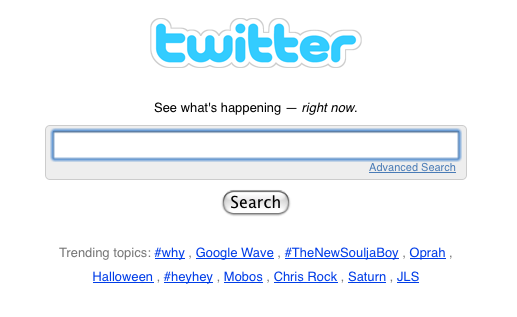 One of the best ways that Twitter has evolved in the last few years months is by improving the search function. Companies can use the search function to monitor who is talking about their company (and their competition) and what those people are saying. Then those companies can follow and direct message the people talking about them and establish a strong, human connection with their audience. Several people in our office are iPhone users and have been anxiously awaiting an App that mimics the BlackBerry Messaging (BBM) feature. Today we thought we'd found it in a new App called Ping. The App works fine but is really just a free texting service and doesn't have the nifty minor features that makes BBM so cool. You can't see when someone is typing and you can't see when someone has read your latest message. Disappointed, Clay (@newmediaclay) tweeted: "OK, downloaded Ping for iPhone. Not as good as BBM...yet. Doesn't have a chat room? Also, can't see when others are typing." Minutes later, he was followed on Twitter by @neartext. After doing some research on his latest follower, he realized that neartext is an upcoming App for the iPhone that takes another stab at emulating BBM. neartext is obviously using Twitter to establish connections with their target audience (even before the App has been approved by Apple). As a company that advocates using Twitter to help your cause, Clay was impressed by neartext and began following them for updates so that he could be the first to try out the App as soon as it gets approved. Curious to see how closely neartext was monitoring Twitter for competitor mentions, I (@pomer) sent this tweet out about an hour later: "Just got Ping for iPhone. Not as good as I'd hoped for. Doesn't have near the functionality of BBM. I wish there was a good alternative..."
Now if that doesn't show up on their radar for people who they want to be in contact with, I don't know what does. It looks like they aren't keeping as close an eye on Twitter as we'd initially thought. The lesson here is that it's important to not only check Twitter and establish a connection with your audience, but to do it consistently. Twitter is a service that thrives because it is what's happening right now. I may not be as interested in what they have to say tomorrow or next week as I am right now. Right now is when I want to be connected to @neartext. That's when they need to make their move. How are you engaging with your (and your competitors') audience? Stay tuned to this blog for a follow-up post on specific ways to use twitter search and engagement for your brand or company.